Cincinnati, OH - Few can afford golf trips to Scotland, upstate New York, Georgia, England, California, North Carolina and a dozen other places in the same year. But everybody can figure out a way to get to Ohio and to Legendary Run Golf Course, 18 holes of staggering beauty in an eastern suburb of Cincinnati where each hole has a plaque and is named for a great hole elsewhere in the world. The course was laid out, explains owner Mike McCaw, to pay homage to great golf around the world with a European front half and American back side. The split also brings the golfer two types of play. The front nine is open with features rolling, sometimes sculpted terrain: a links series of nine holes where fairway bunkers, mounds and knolls give a look of high latitude Scottish golf, complete with the wind ripping off the Ohio River, somewhere to the south about a mile away. Holes on the front side are named for Prestwick, Muirfield, Cleneagles and Troon. The backside evokes golf in the woods because this side dips into glens and glades and feels like the foothills. Here you'll find Shinnecock, Pine Valley, Baltusrol and Augusta. One approach should be mandatory. Leave the golf carts behind and walk the front side. Get the cart for the back. While the starter and cashier in the clubhouse will not necessarily encourage walking on this side, neither do they discourage it. There is even a price break for the traditionalists who want to walk the front nine. Walking the front nine at Legendary Run takes a golfer back to bygone eras. It brings the golfer an opportunity to consider and think about details he might otherwise have missed from a speeding cart: the look of an undulating fairway, the long shadows of a green-side bunker in the morning light, a pair of red-winged blackbirds sparring in the cat-tails of a fairway pond. If the round comes after a week of rain in the Buckeye State - more like a month of rain this year - or at a time when carts are restricted to the paths, then walking on the front side is really the only way to go. For those fortunate enough to play on a sunny day after rain and after the greens have been rolled and mowed, the quality of the golf at Legendary Run will be spectacular. 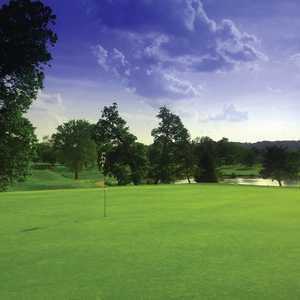 It is as good as it gets within a 100-mile regional radius of Cincinnati and that includes some top-notch country clubs. It is that good. The golf here will challenge the fortunate few among us who post a scratch or two- or three-stroke handicap and for those with skills that are not fully developed - that is, the weekend hacker - expect more than a few three-putt greens. 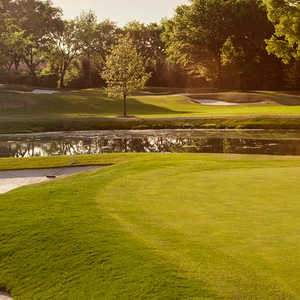 The conditions and the Arthur Hills design with its seven lakes, gentle meadows and virgin woods will not disappoint golfers who are accustomed to country club quality. It is simply a beautiful course, and here's why: "A good golf course is all about architecture,'' says McCaw, the 46-year-old owner of the course, which opened on 200 acres in 1997. While the greens are incredibly slick, the balls also roll true. Hard greens usually don't hold approach shots but that is not the case at Legendary Run. Somehow these greens putt like you are on a swooping sheet of plastic but they are soft enough to caress and hold long irons, and even a lucky fairway wood will check up nicely. The front side of this course achieves its feel of the Scottish highlands by blending native Ohio grasses on either side of the many fairways with challenging pot bunkers near the greens. Most greens invite a Scottish bump-and-run style of play with an open area front and center leading from the fairway to the green. The land was not always a golf course and has a storied past. Once it was the horse farm of former financier Marvin Warner, an ambassador to Switzerland during the Carter Administration who was caught and convicted of fraud when his Home State Savings Bank brought on the collapse of the Ohio savings and loan industry in the mid-1980s. He went to prison and the land traded hands until it was finally purchased by Mike McCaw and developed into this great golf course. The stone gated entryway from that time is still along the 18th fairway. You are liable to see some amazing things here, particularly considering it is a public course. Do not be surprised if a guy raking a trap stops to watch your foursomes' approach shots, then scrambles up onto the green after the shots to fix each ball mark. Another time, after watching one foursome hit, a marshall tracked the flight of one wayward ball and then spent five minutes tromping through the gorse, looking for it for the golfer, even though the foursome had moved on. It is that kind of attention to detail and customer service that makes this suburban course a dream track. McCaw said conditions and attitude of the staff are always in tip-top shape for a simple reason: "We want golfers coming back." While the front side is largely open with plenty of natural fairway undulation - some humps were man made as well - the backside is almost like another course. It cuts around and through wooded areas. 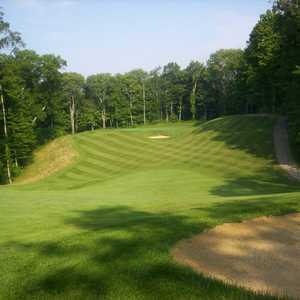 It has tight fairways with large stands of ash and oak pressing in on almost every shot. These nine holes wind past and through a subdivision but somehow manages to keep the homes out-of-sight and definitely out-of-mind. Basically, you don't know the houses are there. Here the golf is like a mountain or highlands course in North Carolina. There are steep hills leading up to greens and sheer drops behind. Fairways bend and swoop. The woods press in from all sides on most holes and fairways narrow down to a sliver of green ribbon. Number 12 is a prime example. Called the Oakmont, a drive to a trap about 220 yards out brings a beautiful approach across a gully to a deceptively challenging green. It is followed by the straight and simple Number 13, which has a fairway about as narrow as dental floss. Legendary Run ends with a genuine 19th hole. A pure 147-yard carry across water to a tough green. McCaw had some leftover land enroute from the 18th the clubhouse. Why not a finishing extra hole, he wondered. Viola, there it is. It is the ultimate tie-breaker and a finishing tribute to a great course where you'll find the spirit and inspiration of many great holes from around the world sneaking into your round. John Eckberg has been a life-long bogey golfer, whose addiction to the sport began with nine-iron pitches to and from neighbor Frank Haines's back yard and on the golf courses in and around Akron, Ohio. His fondest golf memories date to his teenaged-years when he and his brother would annually sneak into PGA events at Firestone Country Club, then spend the day eluding marshals as part of the army that trailed Arnold Palmer.